Discovering that you are suffering from a skin allergy during menopause can be unexpected. However, menopause lends itself to new allergies developing, or to existing allergies becoming worse, for a number of direct and indirect reasons. The best way to begin controlling skin allergies is by finding out why you are suffering from them. The hormonal imbalance that your body is experiencing during menopause has a huge effect on your immune system, which is responsible for keeping allergies at bay. When hormone levels are interrupted, the immune system begins to get confused. Allergies occur when the confused immune system mistakes a harmless substance for a threat and produces histamine to fight it. It is the production of histamine that causes the common symptoms of skin allergies, such as itchiness and rashes. 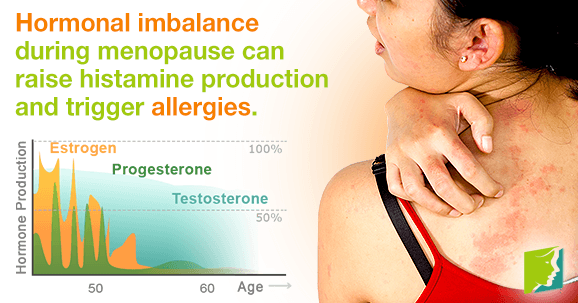 This hormonal imbalance is a direct cause of suffering from skin allergies during menopause. Stress levels can really heighten during menopause. This is because most women have to contend with at least some of the symptoms that can occur as a result of their body's hormonal imbalance, which can include mood swings and hot flashes. This combination of factors can leave you feeling more tired than usual, and this can in turn raise your cortisol levels. These elevated levels can both cause and worsen skin allergies, leaving you particularly exposed to them during menopause. As well as developing new skin allergies, menopause can be a prime time for preexisting skin allergies to become more troublesome. The extent of how much you suffer from skin allergies can vary from mild symptoms of a new allergy to more severe reactions to long time skin allergies. Menopause usually has an impact upon the day-to-day life of women. Many of the negative lifestyle changes made as a coping mechanism for all the other menopause symptoms can heighten your likelihood of developing skin allergies. Developing or experiencing exacerbated skin allergies during menopause can be confusing and frustrating. Reasons for this development can be put down to the direct cause of unbalanced hormones. Read more about allergy treatments.